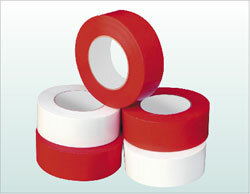 Stucco Tape is a conformable low density polyethylene film, coated with an aggressive rubber adhesive. It is designed for construction, and remodeling, and that is ideal for masking window and door frame during stucco application to protect from overspray. This product provides clean removal with little or no adhesive residue from most opaque surfaces up to 30 days after application.